1. Lay a tortilla down on an oiled baking sheet. Evenly sprinkle 1/4 cup of the cheese over the tortilla. Top with another tortilla. Evenly sprinkle 1/4 cup of the cheese over the tortilla. Next, arrange the Chiles, sausage, potatoes and tomatoes on top of the tortilla. Drizzle with a little olive oil and season lightly with salt. Repeat with remaining ingredients. 2. Bake in 400 degree F oven until potatoes start to brown and tortillas are crispy, about 10 to 12 minutes. 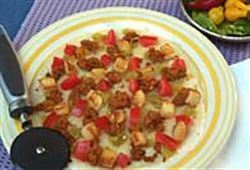 Enjoy this delicious potato chorizo pizza Mexican recipe!